AMP SUPPLY LA-1000 Amp Primo Tube Set 6LQ6 (4) - TUBES ONLY. LA-1000, LA-1000NT - 6LQ6 matched quad - TUBES ONLY NO AMPLIFIER!!!! Complete Primo amplifier tubes wth matched (gain, plate current) power amp tubes. 6LQ6/6JE6/6MJ6 (4) - USA made and plate current matched. Total Tubes in this set. Various brands in quad all plate current matched for best output. Tested at 90%+ NOS levels. Need a different configuration of tubes or different brands? On a budget and really need a set of tubes? Checkout our RECYCLED tube sets of prieviously played tubes with lots of remaining life - great for spares or budget minded musicians. With over 11,000 customers and 13 years of providing great value for musicians all over the world, we think you will love our product and customer service. We do NOT declare custom's values less than the listing amount! We specialize in Analog/Digital Audio Systems, vacuum tube sets and electronic components for many Audio and Radio Frequency (RF) applications including vintage guitar, organ and harp amplifiers, sound effects, mono and stereo HIFI, pro audio, and ham radio. Our pre-packaged GENERIC, PRIMO and ULTIMO vacuum tube sets use a combination of vintage tubes from the 1940s to new tubes of the present. All of our tubes are tested, matched when necessary and carefully placed into custom tube sets for our customers at everyday affordable prices. Our extensive experience and comprehensive testing means we throw out a lot of old and new tubes if they test below minimum NEW reading on our calibrated tube testers or they dont pass the LIFE TEST. For customers who want specific tube brands, these are often available as individual or matching tube sets. Or Individual Tube Sets by Type. We arrange all the individual tubes we sell into several classes to make it easier to find what you need. 2D21, 3B22, 3B24, 3B28, 5AR4/GZ34, 5U4, 5V4, 5Y3, 5Y4, 5Z3, 6CA4/EZ81, 6V3, 6V4/EZ80, 6X4, 6X5, 12X4, 35W4, 35Z5, 0A2, 0B2, 0C3, OD3, 80, 83, 412A, 866. 6AB4, 6AF4, 6AK5, 6AL5, 6AN8, 6AQ8, 6AT6/6AV6, 6AU6, 6BA6, 6BE6, 6BF6, 6BH6, 6BJ6, 6BJ7, 6BJ8, 6Bk7, 6BL8/ECF80, 6BN4, 6BN6/6KS6, 6BN8, 6BQ7/6BZ7, 6C10, 6C4, 6C5, 6CB6, 6CG7/6FQ7, 6CS6/EH90, 6CW4/6DS4, 6CW5/EL86, 6CX8, 6D10, 6DE7, 6DL4/EC88, 6DJ8/6922, 6DR7, 6EA8, 6EQ7, 6EU7, 6EW8, 6FG6/EM84, 6GC5, 6GH8/6U8, 6GK5/6FQ5/EC97, 6H6, 6H30Pi, 6HA5, 6HR6, 6HS6, 6HU6/EM87, 6J5, 6J7, 6JC6, 6JK6/6JL6, 6JH8, 6K11, 6N1P/6H1N, 6N7, 6SC7, 6SA7, 6SH7, 6SJ7/6J8, 6SH7, 6SK7, 6SL7/6H9C, 6SN7/6H8C, 6SQ7, 6U10, 6V4, 12AU6, 12BA6, 12BE6, 12BH7, 12AT7/ECC81, 12AU6, 12AU7/ECC82, 12AV7, 12AX7/ECC83, 12AY7, 12BH7, 12BZ6, 12FQ7, 12DW7/7247/ECC832, 403A, 407, 417A, 417B, 6973/6CZ5, 7199, 6267/EF86, 5691, 5692, 5693, 5751, 5879, 6350, 6414, 7119, 7233, 7360. 6AQ5, 6AS7G, 6BQ5/EL84/6P14, 6F6, 6K6, 6L6GC/5881, 6V6/6N6C, 6CA7/EL34, 6550/KT88, 7591,7027, 6BM8, KT66, KT77, 6GW8/ECL86, 6Y6, 50C5, 12AQ5, 25L6, 35L6, 45, 50L6, 7868, 2A3, 300B, 6973. 6CL6, 6GK6, 12BY7, 5763, 6360. 6146/A/B/W, 6JB6, 6JG6/6KV6/6JR6, 6JM6, 6JT6, 6KD6, 6KV6, 6JS6C, 6LQ6/6MJ6/6JE6, 6LB6, 6LF6, 6LR6, 6LX6, 6HF5, 6GE5, 6GJ5, 2E26, 6883, 8298/A, 572B, 807, 811A, 813, 814, 1625, 12JB6, 8950 conversion kits. Note: we have RF power tubes for most ham equipment manufacturers including Ameritron, Collins, Drake, Galaxy, Hallicrafters, Heath, Johnson, Kenwood, Knight, National, Swan and Yaesu. Typical tube manufacturers include the following. 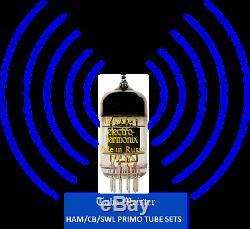 USA Made: RCA, Sylvania, GE, JAN, Hammond, Conn, Baldwin, Silvertone, Delco, EIMAC, etc. Foreign made: Russian Military, Sovtek, Svetlana, Shuguang, Electro Harmonix, JJ Electronics, Winged C, and Ruby. STANDARD and PRIMO Tube sets usually DO NOT INCLUDE manufacturers such as Genalex, Telefunken, Mullard, Phillips, Valco, Western Electric and other high priced tubes. These tube brands are sometimes available as individual or matching sets in the Individual Tubes by Brand. Links of the store or may be available in our ULTIMO. In order to offer the best prices for our customers, we may substitute high quality equivalent tubes in our STANDARD and PRIMO tube sets. To see a cross reference table of equivalent tubes that are equal or better in performance than the original tubes. We are an authorized dealer for Electro Harmonix, Tungsol, Mullard, Genalex, Sovtek, and Svetlana products and also supply Valve Art, JJ/Tesla, Ruby and USA NOS tubes for many analog applications. We work hard to establish product quality and value and get the products to you as quickly as possible. We appreciate your business and feedback as it helps us grow to serve you better with new products, better services and great values. WE DO NOT knowingly infringe on others established intellectual property rights. TUBEMEISTER warrants against DOA (dead-on-arrival) or differences between an item description (exclusive of illustrative pictures) and the items received. In transit back to us with a copy of the invoice within 7 days of your receipt of the item. Due to the many variations in circuit components including the condition and aging of capacitors, resistors, etc, we can not guarantee how a particular tube will sound in your equipment compared to your current tubes. Our tube set configurations are based upon customer feedback of tubes that sound good and are the most popular for the amp/preamp/radio. Due to differences in vintage tube gear we can not guarantee that the tubes will test the same in your tube tester or will meet the specifications of your particular equipment or are fit for a particular application. We DO NOT WARRANT the operation of our tubes in defective amplifiers or electronic equipment! Make sure your amplifier/electronic equipment is operational before you plug in new tubes (from us or any other vendor). If you are not sure, take your equipment to a qualified technician who can install our tubes correctly. We cringe just thinking about our great customers throwing away their old tubes which end up in the local dump. Many times the old tubes have hours of good life and great tunes left in them for people to enjoy. We test and recycle them to new customers at great prices, and the planet has a few less pieces of glass and metal buried for hundreds of years! Ask other vendors to issue a trade in credit and they only laugh at you! A Recycle form is sent with your tube set and instructions on returning your old tubes. Do it Yourself (DIY) Tube Installation. Tube Cross Reference, Bias Values. HI FI Amp Tube Sets. Mesa Boogie Amp Tube Sets. More Guitar Amp Tube Sets. The item "AMP SUPPLY LA-1000 LA-1000NT Amp Primo Tube Set 6LQ6 (4) TUBES ONLY" is in sale since Saturday, October 08, 2016. This item is in the category "Consumer Electronics\Radio Communication\Ham, Amateur Radio\Ham Radio Amplifiers". The seller is "bobsezshop" and is located in Carlsbad, California. This item can be shipped worldwide.